It is no secret that I abolsutely LOVED Abandon. It was my first Meg Cabot book, and she had me hooked. I was eagerly awaiting the release of Underworld and was so happy when it finally arrived. Underworld did not dissapoint. It delivered in full force, and handed out every element that I was looking for. Suspense, thrills, romance and humour. I adored Pierce and her light-hearted, sarcastic humour, nothing changed in Underworld, if anything, I like her more! John is one of my favourite male characters, he's rough around the edges, but deep down he is very capable of loving and doing the right thing. I was always rooting for Pierce and John, so I really enjoyed seeing their love blossom throughout the novel. Now the book isn't all hearts and rainbows, it is the Underworld after all. Meg Cabot did not skimp out on the dark, haunting suspense. She would end each chapter with a cliffhanger. "Just one more chapter" was a common phrase in my house while reading Underworld, but I couldn't stop. One more chapter turned into two, then three and four and..well, you see where I'm going with this. The only negetive that came out of this book was that now I'm going to have to wait for book 3! The wait is already killing me, I don't know how I'm going to do it! 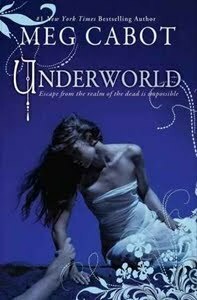 I liked Abandon a lot too and I hope to read Underworld soon-I just adore Meg Cabot!